The Low-Down: Swing Kids is South Korean hitmaker Kang Hyeong-cheol’s new film set during the 1950s Korean War in Geoje POW Camp with a Step Up twist to it. It’s a film about ideologies and how dogmatism and otherness can lead to unnecessary bloodshed, something seemingly of the past yet still very present in the recent climate. Also, the comedy and dance moves will knock your socks off even if you don’t understand Korean culture, history or tap dance. The Story: North Korean POW Ro Gi-soo (Do Kyeong-soo or D.O. of K-Pop boyband sensation, EXO) and three other unlikely members come together as members of African-American Sergeant Jackson’s (Jared Grimes) tap dance troupe. 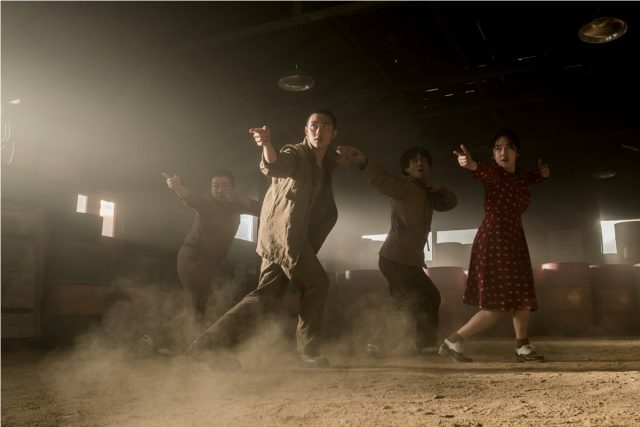 The team includes Chinese choreographer turned soldier Xiao Fang (Kim Min-ho), Kang Byeong-sam (Oh Jeong-se) who was wrongly accused as a Communist, and strong-willed quadrilingual Yang Pang-rae (Park Hye-soo). The Good: Camera direction, editing, and transitions are as tight as they can be, to compensate for Swing Kids’ otherwise mostly bland moves of traditional tap dance some. The crew and cast also spice the dance sequences up with some exaggerated hand gestures to great effect and creative camera angles for some added dramatization. The soundtrack choices are on point, featuring a mix of classic Swing music, Korean oldies, and even David Bowie. The Not-So-Good: Swing Kids suffer from sloppy storytelling and a mostly incoherent plot. The narrative was comprehensible but starts going downhill when Kang and crew decide to invest in various unnecessary subplots. Demonstration of victim struggles with racism, ideological differences, and gender discrimination felt excessive at times too. Knock-Out Performances: D.O. deserves more praise than he’ll get from viewers seeing him for the first time. Apart from the mesmerizing tap dance moves, which he and his co-leads spent about six months practising, D.O. gets lots of room to show his emotional range. Kim and Oh almost overshadow D.O. with their comedic lines and interactions, stealing the spotlight every time they come on. Watch Out For: The scene where Xiao Fang and Byeong-sam communicate through dance moves on a rainy day while Gi-soo watches with a judgmental eye. And the extended dance scene on stage towards the end. Recommended? Yes. Swing Kids is enjoyable popcorn entertainment and it doesn’t try to prove itself otherwise. The movie is packed with silliness and neat dancing moves, but not without dark and sombre undertones that leave viewers laughing one moment and tearing the next. Recommended? Yes. 'Swing Kids' is enjoyable popcorn entertainment and it doesn’t try to prove itself otherwise. The movie is packed with silliness and neat dancing moves, but not without dark and sombre undertones that leave viewers laughing one moment and tearing the next. Previous articleCaptain Marvel’s Stars Coming To Singapore This February!